Scottish country dancing (or SCD, for short) is a modern form of the country dancing popular in England and Scotland in the 18th century. It involves groups of six to ten people — a set — dancing to the driving strains of reels, jigs and strathspeys played on the fiddle, accordion, flute, piano, drums, etc. (no bagpipes, mostly!). Think of SCD as a cross between square or contra dance (although there is no caller) and ballet. There are about a dozen basic figures which will get you through quite a number of dances, although many dances have their own quirks and specialities which make them unique and fun to dance. SCD is a very social form of dancing, not only because you get to dance with seven or so people at once instead of just with one partner (smiles and eye contact are almost mandatory) but also because there are workshops, balls and social dances being held in places all over the world. It is nice to be able to travel and join a SCD group for a night nearly everywhere you go. 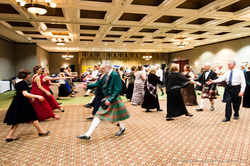 SCD has its headquarters in Scotland and is known as the Royal Scottish Country Dance Society (RSCDS), with branches all over the world and approximately 25,000 members. The health benefits of dancing is a proven fact; however, here is something you might not know: Frequent dancing makes you smarter. In Use It or Lose It: Dancing Makes You Smarter, Richard Powers discusses the latest research on dancing and mental health. It is now known that dancing increases cognitive acuity at all ages and frequent dancing reduces the risk of dementia by 76%. That is the greatest risk reduction of any activity studied, cognitive or physical.